These averages were formulated from 581 Mission Hill apartments that were either rented in the last 12 months or are currently listed as available. The real time vacancy rate was determined by combining the total number of currently available apartments with the number of units that will become available in the next few months, and dividing by the total number of apartments in the database for the neighborhood. The population and average income data was pulled directly from the United States Census Bureau. According to the findings, average rent prices in Mission Hill are considerably lower than the bordering neighborhoods of Fenway and Symphony, but more expensive than its neighbor to the South, Jamaica Plain. For a 1-bedroom apartment, Mission Hill residents save, on average, over $400 per month when compared to renters in Fenway and Symphony. However, a Mission Hill renter would pay nearly $200 more per month than a tenant in Jamaica Plain for a comparable 1-bedroom. Price variations are very similar for 3-bedroom apartments, with rent prices averaging $400 more per month in Fenway when compared to Mission Hill, and $200 less per month for Jamaica Plain. Overall, Mission Hill is a great option for renters on a budget who want to live in the city. Out of the 22 areas sampled, Mission Hill ranks 15th highest in rent for studio apartments, 14th highest for 1-bedroom apartments, and 12th highest for 2-bedroom apartments, making it one of the more affordable neighborhoods in Boston. Mission Hill Pads is powered by the Boston Pads database. This data is available any time over the phone from a professional staff as well as licensed real estate agents working in the Greater Boston Area. Landlords, renters, and property managers can get customized assistance and catch a glimpse of the rental market in any neighborhood, including current rent prices, vacancy rates, trending topics, and more. 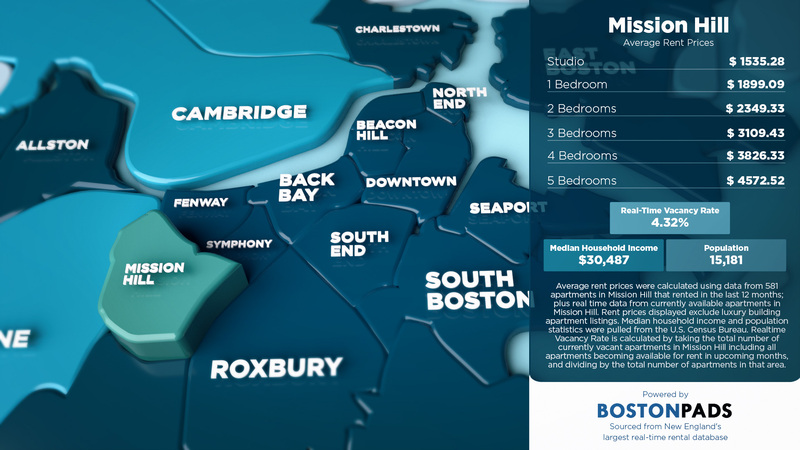 Boston Pads uses this data to help local landlords set the right price for their units and keep their apartments occupied. This data-centered and locally-focused strategy has helped Boston Pads build their network of over 16,000 Boston area landlords. Property managers and landlords who list with Boston Pads access the most comprehensive marketing coverage available. Their listings are blasted out to large national platforms like Zillow, Craigslist, and Trulia, not to mention more than 80 local real estate listing websites, and 100+ local social media pages on Facebook, Twitter, and YouTube. By offering the most comprehensive marketing coverage combined with the latest data, Boston Pads has positioned itself as the real estate and information technology leader in New England. Their platform is nationally scalable and adaptable to any market. It can be utilized by any agency or landlord to access tools that can help them increase revenue and streamline marketing efforts. To see average prices for more towns in the Greater Boston area, check out the latest infographic on average rent prices in Boston by town.